It is well known that H. P. Lovecraft was virtually ignored by the mainstream literary community in his time, being known only in the tiny worlds of amateur journalism and fantasy fandom. And yet, it is surprising how much comment on Lovecraft appeared in various venues, both obscure and prominent, in his own time and just shortly after his early death in 1937. 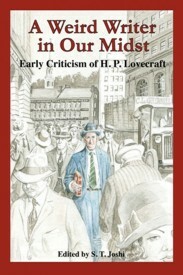 This volume gathers, for the first time, a wide array of early criticism of Lovecraft, including poignant obituaries by such friends as Walter J. Coates and Hyman Bradofsky; early attempts to analyze Lovecraft’s work by such writers as Rheinhart Kleiner and Frank Belknap Long; voluminous discussions of Lovecraft’s tales in the letter columns of Weird Tales and Astounding Stories; an abundant selection of criticism from the fan world of the 1930s and 1940s, including articles by August Derleth, P. Schuyler Miller, and Francis T. Laney; and reviews of the first Arkham House books of Lovecraft’s work by Will Cuppy, T. O. Mabbott, Vincent Starrett, William Rose Benét, and many others. Compiled by S.T. Joshi, a leading authority on Lovecraft’s life and work, this volume sheds unique light on the faint wisps of recognition that Lovecraft received during and just after his lifetime—recognition that would become universal and worldwide with the passing of decades. Preface to The Shunned House by Frank Belknap Long, Jr.
A Weird Writer in Our Midst: Early Criticism of H. P. Lovecraft. Edited by S.T. Joshi. New York, NY: Hippocampus Press; 2010; ISBN 978-0-9844802-1-0; softcover; 264 pages.